To suggest that the West Linn girls basketball team didn't stomp on the accelerator at the start of its Thursday playoff opener would be a bit of an understatement. To be fair, though, you can't stomp on the accelerator if you can't find the keys. Indeed, the fourth-ranked Lions trailed No. 29 Cleveland by four points late in the first quarter and clearly hadn't hit top speed. But West Linn got it in gear at the end of the first quarter, began to accelerate in the second and just flat left the Warriors in the dust in the third period, eventually winning 63-43 at West Linn High School in the first round of the Class 6A state playoffs. "I think we were all a little nervous coming into the first playoff game, but once we got going, I think it got a lot better," said West Linn junior point guard Cami Fulcher, who finished with seven points, six rebounds, eight assists and two steals. 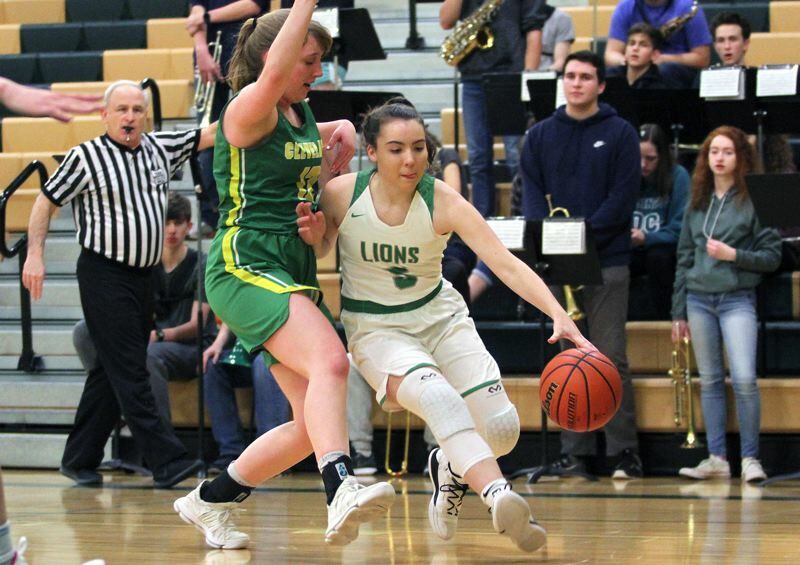 "Honestly, I think it was because we haven't played a game for a week and we lost how to play basketball," said West Linn junior guard Audrey Roden, who led all scorers with 20 points on 8 of 13 shooting from the field (including four 3-pointers), along with six steals, three rebounds and two assists. "It felt kind of like we didn't know what to do with the ball, but it picked up after halftime." With the win — West Linn's third straight — the Lions improved to 19-6 overall after finishing tied for second place in the Three Rivers League. The Warriors, meanwhile, lost for the third straight time and ended their year at 11-14 after finishing fifth in the Portland Interscholastic League. Next up, the Lions will host No. 20 Central Catholic — the Mt. Hood Conference champion — at 7 p.m. Friday in the second playoff round with a berth to the Class 6A state tournament on the line. The Rams improved to 17-8 overall after upsetting No. 13 McMinnville 38-32 in their Thursday playoff opener. While the Lions went just 2 of 10 from the floor and turned the ball over four times in the game's first six minutes, the Warriors got seven points (including two 3-pointers) from freshman Gretta Baker to grab a 9-5 lead with 2 minutes, 19 seconds to go in the first quarter. But the Lions awoke then and there, got back-to-back "3s" from Roden and added a driving hoop from senior Katie Schoenborn to lead 13-9 at the end of the opening quarter. Schoenborn — one of just two seniors on the West Linn roster — stayed hot in the second quarter, scoring six points in the first 2:22 of the period to push her team's lead to 19-12. Lion junior Elisabeth Dombrow added five points (including a 3-pointer) in the quarter and sophomore Payton Shelstad another four, but Cleveland wasn't done yet. Warriors junior Kaiea Waiwaiole stepped up to score six points in the second quarter, senior Lindsey Hausafus added another four and senior Grace Pytynia-Hillier hit a "3" to keep their team's deficit to just five points late in the frame. But the Lions closed the half on a 7-2 run — including Shelstad's four — to lead 34-24 at the break, then left the Warriors behind in the third quarter. There, West Linn built a 22-8 advantage that extended its lead to 56-32 and effectively ended the contest. Roden took over big-time, hitting four straight shots and scoring 10 points in the latter half of the period as her team went 9 of 14 from the field. Cleveland, meanwhile, made just 3 of 13 shots from the field (including two "3s") in the quarter, turned the ball over four times and scored just eight points. "It was very fun," Roden said. "We got back into the flow and figured out how to play basketball again." "One thing we need to work on is getting out on the shooters," Fulcher said. "Especially in the first half, most of their points came on '3s,' so I think that's definitely something we have to focus on is getting out on shooters." For the game, Schoenborn added eight points on 3 of 6 shooting from the field (including one "3") along with three rebounds and two steals, and Vonleh added another eight points and six rebounds. Baker led the Warriors with 16 points on 4 of 17 shooting from the field (including three "3s") and 5 of 11 foul shots, along with four rebounds, while Pytynia-Hillier added 12 points on 3 of 10 shooting from the field and a 4 of 4 day at the line, along with six rebounds and two steals.